Aazad Law Associates is not only a law firm but is also licensed as private detective agency in Lahore Pakistan. Aazad Law Associates works in coordination with other private spy agencies in Pakistan. Many Private intelligence agencies in Pakistan are working in coordination with Aazad Law Associates. We provide private detective in Lahore Pakistan and our each Private investigator in Lahore is very much experienced in the field of Private detective agencies in Pakistan. Private investigation companies in Pakistan now play an important role in all types of investigations. Investigation include civil, criminal, corporate, financial, pre-matrimonial, post matrimonial, cheating spouse, political and all other investigations. Our fact finder in Lahore Pakistan and private detective in Islamabad conduct all types of investigations. Back ground checking of any person or employee. If you are looking for a private detective in Lahore Pakistan or if you need services of a private detective in Islamabad. Aazad Law Associates is the best place as our private detective agency in Lahore Pakistan not only provide services in Lahore or Islamabad but abroad also. We also have top Private spy agencies in Pakistan on our panel. They are the best among all the Private intelligence agencies in Pakistan so please contact Aazad Law Associates to hire our best Private investigator in Lahore Pakistan. 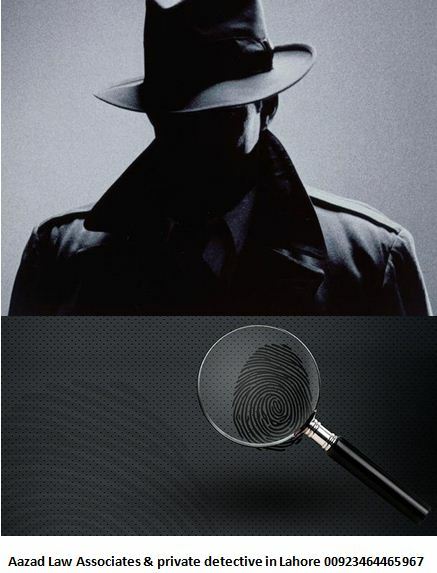 You can also hire our private detective in Islamabad. Our investigation company is the best among all the private investigation companies in Pakistan. Due to work load mostly our work is done in Lahore. Finally we in addition to all the information given above We would like to inform you that Please contact us only for work legally permitted. Since we are a law firm so we can help you legally only. Any information which is either illegal in nature or not permitted by law cannot be availed. So while contacting us please bear in mind that we do not facilitate any illegal activity because we have to work within the parameters provided by the law of Pakistan. Therefore contact us for legal work only. Advocate Muhammad Ali Naeem Azad the CEO of Aazad Law Associates founded Aazad Law Associates in the year 2008 which is now one of the leading law firm not only in Lahore Pakistan but also in other cities of Pakistan and in other countries of the world. Our office address is 19A Abbot road Barq plaza 2nd Floor Lahore Pakistan.